Use the coordinates you saved from completing My Special Place in the Database, and with the SAS locate a collection of spectra that are available near that location. Click Submit. Results will appear to the right of the box. 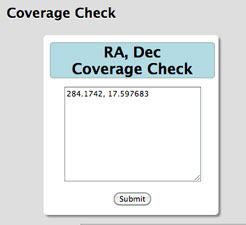 In the Plate Coverage column, click any plate link to go to the complete list of spectra captured on that plate.